ANN ARBOR, Mich. – One in four students from lower-income families did not participate in a single sport, club or art program last school year, a new national poll shows. Among parents from households earning less than $60,000 a year, 27 percent say their child was less involved with school activities because of cost, according to the C.S. Mott Children's Hospital National Poll on Children's Health at the University of Michigan. But financial challenges were not limited to lower-income families. Twelve percent of higher-income parents (making more than $60,000) also cite price as the reason for their child's decline in activities. "School activities allow students to broaden their interests, develop teamwork and leadership skills, and strengthen their connections with peers and their school community. Participation in school activities has been linked to better grades and lower dropout rates ," says Sarah Clark, M.P.H., co-director of the poll. "However, we found that a substantial portion of students, particularly those in lower income groups, are not fully engaged in a well-rounded school experience that includes activities — and too often, it's because of cost." The nationally representative household survey included 666 parents with at least one child in middle or high school. 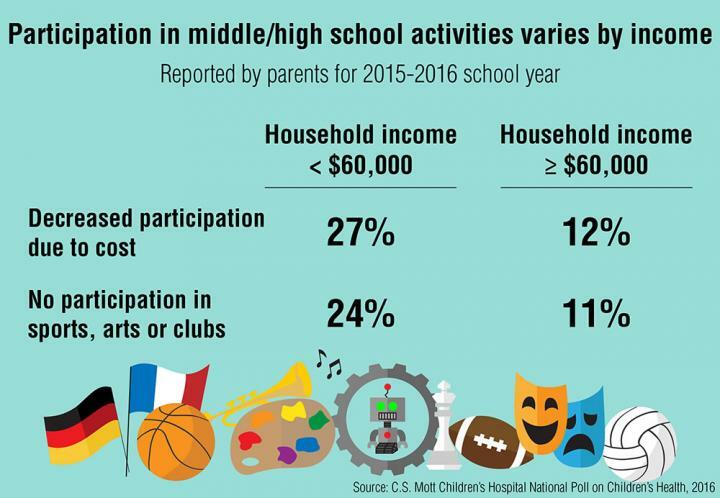 Parents were asked about their child's participation in school activities for the 2015-2016 school year. Sports were costlier than other types of school activities. The average, annual cost per student was $302 to play sports, $218 for arts and $124 for clubs, according to the poll. That includes school-mandated participation fees and other expenses such as equipment and travel. Ten percent of lower-income and 3 percent of higher-income families received a waiver for activity fees. "School officials should consider the equity of participation costs across different activities, so that students interested in sports have equal access to participation as students interested in music, theater, or clubs," notes Clark. Many schools offer a variety of activities, including those with low or no cost, says Clark. Poll results reflected this trend, with 60 percent of parents reporting no cost for their child's participation in arts or in clubs. However, only 30 percent reported zero cost for sports. "For some families, financial burdens may override a child's interest in pursuing school activities," Clark says. "No school wants cost to be the reason for non-participation." Strategies include making sure students and parents are aware of low- and no-cost activities; offering waivers, scholarships, and other cost-reducing options; and addressing non-financial barriers, such as transportation.